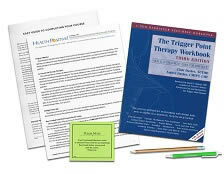 Do you have the The Trigger Point Therapy Workbook textbook? See your enrollment options above for "I already own the text". Trigger point therapy is a proven approach for the relief of soft-tissue pain and dysfunction. The textbook author, Clair Davies, NCTMB, provides a uniquely specific study of trigger point location and alleviation as well as specific cautions and contraindications. This course serves practitioners who want to better understand and reduce their own pain as well as those who want to help their clients. This course does not teach hands-on skills. Please seek additional experience, with a mentor, to add hands-on skills. This is one of the most helpful courses I have ever taken! Lots of information. Great course! I already do some trigger point therapy, but this course increased my knowledge and understanding to a whole new level. This class gave me skills that I immediately began using on myself. This practice gave me instant feedback, enhanced my learning and brought welcome relief to my own problem areas. I am already using techniques in my massage practice as well. Overall I loved the practicality and ease in learning of this course. This was one of the most practical and interesting home courses I've taken and the drawings showing trigger points and referred pain areas for each muscle was very good and will be most helpful. I was able to use this material right away to help my clients help themselves. There is so much information here. It is a wonderful resource to go back to time and time again. It is nice you keep the prices low and reasonable because not everyone has a big business. This is the most useful CE course ever! The textbook does a wonderful job clearly presenting the information in an easy to follow format incorporating multiple learning styles. It suggests numerous approaches for releasing TPs so both beginners, like my 14 y.o. daughter and professionals alike can obtain immediate results. This should be a must read for everyone. Thank you for offering a great course at an affordable price! I am inspired by the work of Clair Davies; his passion for the subject, as well as his objective data and anecdotal examples were fascinating. I am excited to try these techniques with myself and my clients. I loved the emphasis placed on anatomical landmarks. This course has opened my eyes to referred pain patterns and how to treat them effectively. This course, along with the idea of teaching clients self-care, should be a required part of all massage school curriculum. Enjoyed the course, informative & positive! Thank you! I was glad to find a course that I could take on a text that I had already read extensively and interested me very much. This was a very convient way to do the CEU requirements. Quick and easy to do I like it! Fits my schedule and I learned a lot. I really liked this way of fulfilling my CEUs. It wasn't too time consuming and I actually liked the reading material. I learned a lot and know that this Trigger Point manual will come in handy definitely in the future of all my massages. The best and simpliest method of understanding Trigger Point Therapy. Very informative. A must for every massage therapist. It was great to learn how to help clients and also myself through self massage. This course was very educational and I feel I can definitely implement these producers into my massage. A great way to freshen up what you all ready learned in school but you WILL learn something new! The materials (Book) provided was very profressional and well written. Great text for this course. It was very informative. Great class! Great information, I'll keep the book out to refer too. I am using a lot of what I've learned and seeing wonderful results. This book was very informative and I will use it to help my patients in the near future. I loved all the information the book gave on symptoms and causes and treatments. as well as a diagram showing the trigger point and the referred pain pattern, it will be very helpful in my practice. I now feel myself saying, "I bet that pain or symptom is from a trigger point!". I thank you and my clients thank you! I would have to say that this book was very imformative and expanded my knowledge. The figures helped me a lot being I am very visual. I am glad to have taken this particular course. great lessons on self treatment. An excellent condensed resource for the extensive information involved in trigger point therapy. Loved it. I enjoyed reading this book and being able to study at home. I plan to do this again. thanks. Fantastic!! I got a frozen shoulder during this study. The material showed me how to work all the trigger points which in 2 wks time I have gotten my full ROM back. This book ROCKS!! for all locations of pain in the body. What a Gift to be free of pain. Thank you! I will keep this book close by my side for use with myself and clients. Thank you so much!! The course kept my attention. Easy reading with valuable information. So informative. I loved it. I enjoyed the way the book broke down the areas of pain and the possible culprits. It also took it one step farther to give explicit ways to know you are working the right areas. I am a certified neuromuscular therapist, and this was not only a great refresher of NMT, but also the self-help techniques are invaluable to me and to teach my clients. I've been using the Travell & Simons Trigger Point Therapy flip chart in my practice for several years. Very informative and helpful. Also an excellent review of material. I am excited to use this knowledge in my practice. We did a brief section on trigger points while I was in school for massage. This is so much more vast in the knowledge that was learned. I think this needs to be taught to all massage therapists before the get out of school! Clients will benefit from it greatly!!! Thank you for the course! Awesome course learned a lot of how to treat trigger points. Very interesting and helpful to me and will be motivating information for my clients because their conditions are described and validated. The course was excellent! I will take additional courses in the future. Thank you. I loved this! So helpful in my practice and the information is invaluable! Enjoyed the course and would highly recommend it to those seeking to expand their career to include Trigger Point massage into their practice. This course was perfect and just what I was looking for. The questions asked lead me to the book for all my answers. I had to find them. Knowing I was going to find them, made it even more fun. Thank you for a very professional business in this field. Trigger points have always been an interest of mine as a massage therapist. I am always looking for new information to help me in my practice. This course helped me achieve that! Excellent information! Thanks! Great for my practice and my personal health! I was very satisfied with the book and course and love the idea of being able to take the course at home and the test online. Thank you. Certainly filled a gap in my knowledge and i have recomended the book to clients and other therapists. This course really helped me with self help and showed ways for me to teach clients to help themselves. This was an EXCELLENT source of reference & training that will enhance my practice and I will utilize the techniques for self preservation. Wonderful Training! This book has been a valuable tool to my learning as a professional. I have been referring to this book for over six years. I am glad I found the CE availability for this book. Thanks! Loved how this course was taught in simple terms that were easy to understand and apply. Thank you!! I really enjoyed the book. Clair Davies made the material interesting with stories from his personal life and stories from others with trigger point issues. It is pretty inspirational that he was able to figure out Travell and Simons book and put it into concepts for the lay person and for the professional massage therapist. Thanks! Much was review to me but I did learn some new tings. This was a very much needed refresher course. This course was full of information. After reading this book, I now feel it is very important for me to take some trigger point workshops to better assist my clients! This course was great for self care. I'll even be able to incorporate into my own practice some of the techniques used in this program. I would recommend! Heather was very efficient at helping me on the phone. I like having the test, etc online, but appreciate having a person pick up the phone or return a call. I think the workbook is excellent, and the self massage of trigger points has really been beneficial for me. I will recommend the book to clients and friends. Great information!! Best course I have taken in a long time! Found very beneficial and look forward to utilizing in my practice and for self care. I loved that Trigger Point Therapy class. I think it's great to offer one online as there's so much information given, I can't absorb it all just sitting there in a classroom for 2 days. Especially anatomy. I have no idea how many hours I spent as I read page to page. There was so much to learn and the writer was very knowledgable. He made it fairly easy to understand if you followed hiim. I had the opportunity to process the information and pick it up days later and read more. There was a lot to take in. The book explained a lot I will use this book as long as I have my massage practice Great great material. Very informative material and my clients already have benefited from my new knowledge. I like to take my time when doing independent studying, so I enjoyed the fact that the courses have a very long deadline before having to take the test. The test itself is very useful, and the book will always be with me. The Trigger Point Therapy Course has helped me tremendously as a Fitness Personal Trainer. The workbook is such a treasure to me. Very easy to understand. I enjoyed it, learned a lot, and can definitely use this in my practice. I highly recommend this course as a "must" for anyone interested in Trigger Point Therapy. Thanks for a great learning experience! At first I thought the 1 year deadline to complete this course was extreme but wound up being very happy for it when life took a much different course for me and I had major changes that needed my attentions. Thank you for allowing the extended deadline so I could come back to complete this! I am so in love with this book that I plan to develop several self treatment courses for new mothers, older people and in the long run I want to set up a course to teach other massage therapists. Great info that I plan on using daily! This course was so interesting! I can't wait to put it to practice. The course was very good. There were some contraindications on trigger points that I didn’t know. Thank you. Very happy with the course, and very excited to have a new book to add to my library! Love this book, very good read and very practical. Pictures are very helpful. I love the self care techniques. Body mechanics being included as well as misdiagnosed symptoms was fascinating. I had some exposure on Trigger Points and wanted to gain as much knowledge as possible to help clients with various problems. I read the majority of the text book and will use it as a reference, since there is so much excellent information. I also intend to learn more on this topic! Thank you for offering it as a continuing education course! Very valuable info and great reference guide. I am clag I finally have taken the time to delve deeper into this area of treatment. I will definitely apply this treatment to my practice and it will be a great benefit to myself as well for the maintenance of my health also. I liked the ease of finding the areas to work on in the book. It has been put together well. Even though the illustrations are pretty simplistic, it’s easy to find these trigger points. Thank you for offering this material. Good refresher course. I have been using and study trigger points for years so it was fun to see how many questions I could answer without studying the material...I actually did pretty good but studying the text helped me brush up on things I'd forgotten and showed me some things I really didn't know. This course dramatically increased my knowledge of specific muscles and their location. My training was sub-par. Additionally, I have already used trigger point therapy in my practice with positive results. I read through the workbook 2 times and plan to continue to study the material. I absolutely loved this course and it has definitely better equipped me to be a successful massage therapist. Thank you. The information was helpful and I feel more confident when doing deep tissue massage. I will be able to use this to better help my clients. I will definitely use what I have learned from this course! The Trigger Point Therapy course was great! As a massage therapist it is often difficult to schedule a massage for myself, so this course has some excellent tips on how to massage yourself anywhere! It may seem like a lot of material, especially if you read the book verses the online program, but in the end it is totally worth it! I highlighted and underlined so many sections of this book and it is so great to be able to teach my clients how to reduce and eliminate their pain all by themselves! Reading this book has once again revealed to me what an AWESOME creator we have! His creation of the human body is astounding! I've done trigger point for years. This was a wonderful refresher course. I enjoyed it very much and learned a lot I thought I knew but didn't. Thank you! This course is packed with tons of useful information, and great reference materials in both the book and the online downloads that come with the book for the chart sections. It covers so much information that it is a great addition to any practice for the reference value alone. The late Clair Davies & Amber Davies Trigger Point Therapy workbook is an outstanding collection of self help information and case histories that will benefit everyone who reads it. Their literary skills and vast knowledge of TP have provided invaluable information and exemplify the true gift of their dedication to help others. An excellent reference book for my family, friends and clients!!! I learned a lot about trigger points that I can relay back to my clients and use on myself to help relieve some of my own pain and discomfort. I'm definitely going to recommend Claire Davies' book to others needing some pain relief. The test is straight forward and follows the text and easy to find the answers. This course was broken down into simple terms that are easy to convey to clients. The protocols for self-treatment are easy to follow and practice. This course not only shares effective methods for treating our client's pain, but is invaluable to manual therapists who need to treat their own pain. This course was a great review of muscle trigger points, their patterns, and strategy for client pain relief in areas where, even modern technical procedures, cannot locate or alleviate painful joint and muscle movements. Initially, I thought I can easily breeze through this course as revision. Definitely not. This course was filled with new information, It was well-researched and professionally put together. Great ending with chapter 12 concerning tension, emotional stress and a system to handle it. No regrets. I enjoyed that the information was both for the therapist and for the client. I appreciated that the book had illustrations, easy to find referral points and was very clear overall. I will certainly put this information to work right away and have already had success with my own trigger points as I was reading the book and finding them on myself! The book provided for this course was very easy to understand. The methods of treatment were easy to understand and apply. The information was very helpful. I did email when I forgot my username and password and did not receive a response so that is when I decided to call instead. When I called customer service they were very helpful. Great amount of useful info - pics very helpful. Fantastic text and course for the price! I learned quite a bit of new information to use in my practice. Boy these courses are hard as in "not easy"!! This course and the Orthopedic Massage are probably the two best. They are all good, but these two are just packed with material that can be easily transfers to my massage practice. I LOVE this information! Thank you for offering the class and thank you for the option of extending the class when I had allowed it to expire! Using the textbook as a reference, identify the 2 most common trigger point locations in each of these areas: head and neck; shoulder, upper back and upper arm; elbow, forearm and hand; chest and abdomen; mid-back, low back and buttocks; hip, thigh and knee; lower leg, ankle and foot. The suboccipital (sub-ahk-SIH-pih-tul) muscles are located right below the base of the skull; the occiput is the back of the head. The suboccipitals consist of four small muscles on each side, each running at a different angle, connecting the top two vertebrae to the skull and to each other (Figure 4.19). Suboccipital trigger points cause pain that feels like it's inside the head, extending from the back of the head to the eye and forehead (Figure 4.20). It feels like the whole side of the head hurts. This sensation is typical of what you experience with a migraine headache. The treatment of suboccipital trigger points should be part of any approach to dealing with migraine (1999, 472-476). I appreciate that you have several courses that fill the same requirement, given that I have been a licensed therapist for 12 years and this is the 6th time I have been required to do an ethics course for the state license. I have options to choose from, which adds some interest.